Voting took place across Russia on Sept. 8. The most interesting results were those for the Urals elections, where a representative of the Civic Platform opposition party, Leonid Roizman, became the mayor of Yekaterinburg. In Moscow, the turnout was unexpectedly low (around 33 percent), but acting Mayor Sergei Sobyanin still scored enough votes to win. Sunday, Sept. 8, was the day of common voting in Russia. Elections were held at various levels, including the election of the heads of the eight subjects of the Russian Federation and the election of deputies to the regional legislative assemblies in 16 regions. One of the main intrigues of the day was the election of the mayor of Moscow. Acting Mayor of Moscow Sergei Sobyanin scored 51.37 percent, while the opposition candidate from the democratic RPR–Parnas, Alexei Navalny, scored 27.24 percent. These figures are quite different from predictions. At the beginning of the election, these candidates were predicted by sociologists to receive 60 percent and 9 percent, respectively. There will be no second round of elections in Moscow, and Sergei Sobyanin, who is the existing mayor, will remain the head of the capital city. Navalny’s supporters intend to officially contest the announced voting results. On Monday, Sept. 9, they held a rally in support of their candidate. The turnout at the Moscow election was very low — about 33 percent, according to the preliminary data. 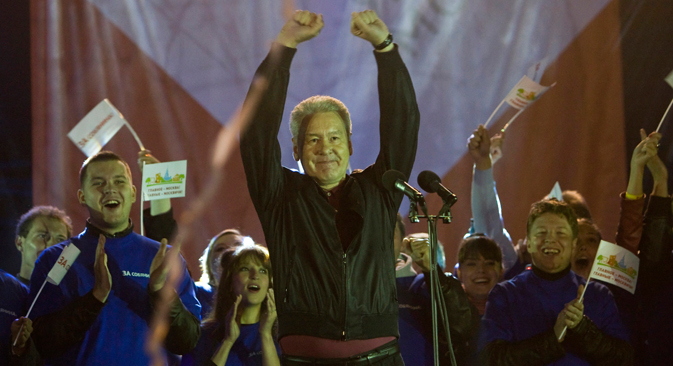 Ten years ago — the last time Muscovites chose their mayor — more than half of eligible voters came out to the election. The Moscow election was carefully prepared for, due to a fear of disturbances. However, there were no scandals. Most voters came in the afternoon. According to the reports on social networks, the most disciplined supporters were Navalny’s. On the day of elections, the central election commission received 54 violation signals from all over Russia: Seventeen violations were from Moscow, and the rest came from the 16 regions. A case of mass SMS distribution with propaganda for one of the candidates in the Sverdlovsk region is being investigated. Bribing of voters was detected in the Yaroslavl region. Representatives of Civic Control (a nonprofit organization for the protection of electoral rights) noted that the current elections are running in quiet conditions and with far fewer violations than during the time of the Duma elections the presidential election. Vice president of the Center for Political Technologies, Alexei Makarkin, believes that these elections were the cleanest. In his opinion, this is a consequence of the protests that took place in December 2011, when people took to the streets to protect the integrity of elections. The biggest surprise was the result of the mayoral contest in the third largest city in Russia, Yekaterinburg. The majority of votes were won by the opposition candidate and president of the City without Drugs project, Yevgeny Roizman, who received 30.11 percent of the votes and beat United Russia candidate Yakov Silin. As for the elections to the regional legislative assembly, there were surprises there, in spite of the leadership of the ruling party United Russia. For example, in Krasnoyarsk, the moderate leftist party, Russia’s Patriots, took the lead. In several regions, the Communists, who traditionally occupy second place in the election, gave the leading position to the Liberal Democratic Party. In general, the elections have shown that different regions of Russia are living at different speeds. "On the one hand, there are regions that live in the old way: The ruling party shows great result, and elections are not much different from previous ones; but there are also big cities, where the situation is completely different. There's another way of voting there. Opposition can mobilize their supporters. There, the people in power have problems,” says Makarkin. “It is now impossible to use the administrative resources the old way. As a result, supporters of the government who really wanted to vote came to the elections, and the rest chose to go out of town — hence the decline in the number of votes for the government. Supporters of the authorities decided that nothing depends on them,” says the expert. Previously, it was always believed that a low turnout is beneficial to the government, but these elections have shown the reverse situation. "The low turnout is beneficial to the government, provided they have the administrative resources; if not, the low turnout is beneficial for the opposition,” Makarkin says. Experts believe that now, after the results of the elections, authorities will no longer ignore the protest vote and will try to accommodate the interests of all residents.